« Host Your Next Event on a New York Yacht! A yacht may not be your first thought in terms of a venue for your corporate event, but it is definitely the best. Yachts provide indoor and outdoor options that are truly unique. Nautical Holidays provides an experience that is customizable and one-of-a-kind. Summer is here and yacht season is upon us in New York. 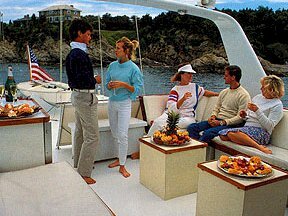 Yacht season typically runs from May until October. Cruising on one of our ships provides excellent views of New York’s vibrant neighborhoods and a glimpse into the city’s culture. Weather the charter is night or day we can cater and customize the perfect voyage for you and your guests. We have boats that are specifically designed to host private events for the corporate community. Our ships can hold from 2 to 600 or more to accommodate any party size. We provide an upscale environment that will be worth talking about. Our ships feature fine cuisines and outstanding service. Yacht’s offer groups a private and sophisticated expedition while traveling around the New York Harbor. Expect gorgeous panoramic views of the Manhattan skyline, a sight well worth seeing. This also includes views of the Statue of Liberty, bridges, and a beautiful New York sunset. Hosting any event by yacht is one that will impress guests not only with fabulous sights but top-notch cuisine and service. For your next event try a New York Yacht Charter that provides high-quality comfort and style. This entry was posted on Wednesday, April 5th, 2017 at 1:19 pm and is filed under News & Events. You can follow any responses to this entry through the RSS 2.0 feed.